I would like to raise an exciting issue that has become very hot recently and has been of great interest to me for a long time: the possibility of synthesizing a living cell from its components. My story starts in 1964. I spent then my first sabbatical with Prof. Harold Morowitz at Yale University. Let me first remind you that these were the early sixties, times of revolutionary ideas. It was the time of planning the trip to the moon. We had entertained the idea, promoted by Morowitz, to synthesize a living cell from its components and turn this project into an American National Goal instead of going to the moon. We started by reconstituting the mycoplasma membrane from its solubilized components. Despite early promising results and a rather provocative paper we published in the Proceedings of the National Academy of Sciences on mycoplasma membrane reconstitution, we failed to progress in this direction. Clearly, we were much ahead of the times. Nevertheless, our idea that was considered crazy 45 years ago has now been revived and appears more plausible than ever. Again, Harold Morowitz was the person who gave it a push at the 5th IOM (International Organization for Mycoplasmology) Congress in Jerusalem in 1984. 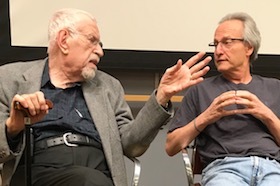 Morowitz pointed out that mycoplasmas are the smallest organisms capable of independent growth and replication, carrying the smallest genomes of self-replicating organisms. Elucidation of their genes may provide the tool to determine the minimum set of genes essential for life. This talk had a considerable impact and pushed forward mycoplasma genome sequencing. In fact, mycoplasma genomes were among the first bacterial genomes to be sequenced about 10 years later (click here and here). It appears that Mycoplasma genitalium is, thus far, the organism closest to the theoretical minimal cell capable of self-replication. It has been of great interest to define the minimal set of essential genes in M. genitalium by selective inactivation or deletion of genes, testing the effects of each of these manipulations on survival and replication under defined conditions. To make a long story short, Craig Venter and his associates have established that the minimum number essential for life for M. genitalium is 381 genes. Venter's early idea was to insert this minimal set of genes into ghosts of M. genitalium cells depleted of their original genomic DNA. This would result in a new, still hypothetical synthetic organism, already named by Venter Mycoplasma laboratorium. The very ambitious project of creating a synthetic mycoplasma has already resulted in heated discussions and controversy, published mostly in Science but getting also into the daily press. Some scientists are being alarmed by the idea that Venter plays God, creating a new organism. But you may understand my feeling of satisfaction at the great interest this creates in mycoplasmas, my baby organisms. Thus I tended to favor Craig Venter's initiatives. Venter does not really need my support and with his exceptional energy and money, his Institute (The J.Craig Venter Institute, Rockville, Maryland) did already succeed in assembling a complete synthetic M.genitalium genome. This project presents an impressive technical feat, joining together chemical synthesis and recombination cloning methodology. It certainly can be considered as an important milestone in synthetic biology. Venter's group has progressed also in a parallel direction by showing that a wild-type mycoplasma genome in the form of naked DNA can be propagated by polyethylene glycol-mediated transfer into recipient mycoplasma cells displacing the recipient cell's original genome. This exploits the fact that mycoplasmas are devoid of cell walls, which facilitates the transfer into the cell of external naked DNA. Thus, what remains to be done is to use this technique to introduce the synthetic M. genitalium genome into mycoplasma cells and to search for cells in which the synthetic genome replaced the original genome. In summation, this somewhat futuristic biotechnological project will be a powerful new approach to understanding biology. In terms of practical applications, one can envision a future in which the complete redesign and prototyping of genomes for industrial microbes leads to new, better and cheaper bio-products. Shmuel Razin is Jacob Epstein Professor of Bacteriology, Emeritus, the Hebrew University-Hadassah Medical School, Jerusalem, Israel.